The mere utterance of Margaret Thatcher’s name still arouses as much emotion and controversy today as in the 1980s. This should come as no surprise; she was Britain’s longest-serving twentieth century prime minister, and one of the most consequential. Though there is little chance that debate over the consequences of her policies will subside in the near future, a more objective assessment of her success in office can be carried out by judging the policies she implemented against her professed aims and ideological platform. Though, much like any other politician, Thatcher’s time in office was not free from failures of judgement — indeed, these inevitably led to her downfall — a remarkable self-righteousness and an ability to seize upon and manipulate crises to her advantage meant Thatcher was relatively successful in the economic, political and foreign policy spheres. The first task of a politician looking to transform a nation’s socioeconomic fabric is to become prime minister. Not only did Margaret Thatcher, the ‘petit bourgeois’ daughter of a grocer and methodist preacher, climb to the top of the Conservative party and win the 1979 election, she maintained an iron-fisted grip on both her party and the country for over decade. Her perseverance and self-conviction made Thatcher one of the most politically successful politicians in the last century. Even from a young age, these traits were apparent. At Oxford, the then Margaret Roberts was barred from the Oxford Union Society as a woman. She therefore resolved to focus on the Oxford University Conservative Association (OUCA) of which she was first treasurer, then President. To win all three leadership elections and all three general elections she ran in, Thatcher had to craft an unmistakable public persona. Here, her attention to detail also became politically invaluable. With the help of former television producer Gordon Reece, ‘Maggie’ was created. As Clarke describes, ‘The hair was wrong, too suburban; it was restyled. The clothes were wrong, too fussy; they were replaced. The voice was wrong, too shrill; it was lowered in pitch through lessons from an expert in breathing’. Once she became prime minister, her personal qualities continued to translate into political success. As a ‘conviction politician’, Thatcher’s unshakeable faith in her the righteousness of her own ideological platform, and the grit and determination she derived from this, was key to her electoral success. In 1978, Thatcher told Sir Anthony Parsons that ‘there are still people in my party who believe in consensus politics. I regard them as Quislings, as traitors’. Faith in her own values meant Thatcher could convey a clear and coherent message, allowing her to ride the wave of neoliberalism first to victory against those in her own party she labelled ‘wets’, and then to electoral success. Thatcher also possessed the rhetorical and communicative skills essential for political success. During the Falklands War, her Churchillian ability to capture the moment was illustrated when, after the conquest of the island of South Georgia, she stunned a crowd of journalists when she snapped ‘just rejoice at that news and congratulate our forces and the marines’. It was these memorable moments that allowed her not only to win 3 general elections, but also to leave behind one of the most formidable legacies of any British prime minister. When asked in 2002 what her greatest achievement had been, Thatcher replied ‘Tony Blair and New Labour’, asserting that ‘we forced our opponents to change their minds’. Thatcher’s longevity, political nouse and ideological certainty allowed her to shift the centre ground of politics to the right. This shift in what the ‘New Right’ in America had begun to call the ‘Overton Window’ meant policies drawn up by think tanks like the IEA that were seen as radical in the 60s became common sense in the post-Thatcher era, and Britain today is undoubtedly still submerged in the consequences of Thatcher’s political successes. This longevity of legacy is the crowning glory of a decade of unrivalled political success which saw Thatcher maintain an iron grip over her party and the nation. That Thatcher was politically successful and left a lasting legacy is indisputable. This does not mean, however, that she was politically infallible. Her three election victories must be seen in the context of an opposition too busy tearing itself apart to mount a coherent resistance to the tide of Thatcherism. As debates on unilateral nuclear disarmament, the EEC, NATO, the entryist Militant tendency and nationalisation polarised Labour, the fissure between the left and right of the party manifested itself as a struggle between Tony Benn on the left and Denis Healey on the right. The dispute led to the ‘gang of four’, four former Labour cabinet ministers, to splinter the party and form the SDP. Gerald Kauffman described the 1983 Labour manifesto as ‘the longest suicide note in history’, and there is no doubt that Thatcher’s electoral success was due in no small part to the weakness of the political opposition she faced. By the end of her reign, Thatcher’s successive election victories and prolonged isolation in Number 10 exacerbated her sense of self-righteousness to such a degree that it eventually became her downfall. Vinen argues that, in her handling of her cabinet, ‘she could be a bully’ who ‘was not always able or willing to reward loyalty’. Clarke describes how, by the end of Thatcher’s tenure, ‘Lawson and Howe ceased to be irritating and became intolerable instead’. Such personal tensions were rooted in Thatcher’s innate stubbornness, and it was this stubbornness that made the Poll Tax such an incendiary issue. By proposing to replace ‘the rates’, a tax on households designed to raise money for local government, with a flat-rate, regressive ‘community charge’, Thatcher’s flagship policy proposal was met by rioting and widespread non-compliance. Bale calls it ‘one of the biggest policy disasters in living memory’. Her stubbornness in delaying an inevitable u-turn ‘contributed mightily to the downfall of Thatcher as the Party’s leader’. The Poll Tax disaster illustrates how Thatcher’s great political strength, her own self-belief, eventually precipitated the end of a decade of election victories that was as much to do with the practical non-existence of opposition as it was a result of Thatcher’s political brilliance. The political economy of Thatcherism was arguably in the making long before Thatcher herself became Prime Minister in 1979. Cockett argues that, since the 1930s, when economic liberalism was at its ‘lowest ebb’, economic liberals had been constructing the ideological edifice Thatcher would eventually draw on. The publication of Hayek’s ‘The Road to Serfdom’, the work of the IEA in the 60s and 70s, and Keith Joseph’s foundation of the Centre for Policy Studies all laid the groundwork for Thatcher’s economic programmes in what Cockett describes as an ‘intellectual revolution’. By contrasting Thatcher’s economic record with the professed aims of the neoliberal movement, her economic success can be fairly assessed. E H. H. Green provides a useful summary of Thatcherite political economy, describing their main objective as ‘to roll back the frontiers of the state’ by ‘replacing the mixed economy with a…market economy’ and ‘reform and reduction of the welfare state’. Institutions that hampered markets, like unions, were to be crushed, and ‘low inflation rather than full employment was to be the central goal of economic policy’. Privatisation is one instance of a successful and groundbreaking policy that fulfilled some of these aims by shrinking the state and marketising utilities like water, telecoms, gas rail and electricity. Privatisation has shown great longevity; the myriad PFI initiatives of New Labour and the privatisation of Royal Mail in 2013 suggest as much. Gilmour also points out that the ‘habitual under-pricing [of privatised industries] made them attractive both to the share-holding classes and and to many that had never before owned shares’, meaning Britain was edging towards Thatcher’s ideal of a ‘capital-owning democracy’. In tandem with the privatisation programme, the sale of council housing as part of the ‘Right to Buy’ Scheme led to a million and a half of the five million council tenants in 1979 owning their homes outright in 1990. Another of Thatcher’s ideals — the ‘home-owning democracy’ — was fulfilled here. She believed that home-owners, anxious to protect their main source of private wealth, would naturally become more conservative. Trade Union reform was another flagship Thatcherite aim. Both the 1966 labour and 1970 conservative administrations were brought down by the trade unions, and the ‘Winter of Discontent’, whose wave Thatcher had rode to victory in 1979, was still etched into the public memory, giving Thatcher a true popular mandate to dampen trade union power. The 1984 Trade Union Act required secret ballots where a majority of members vote to elect the governing bodies of unions and to decide whether to hold a strike. 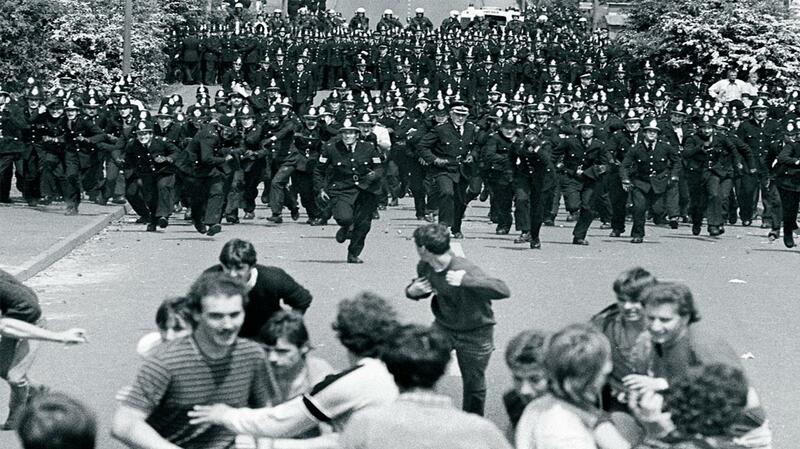 Though crucial, it was the outcome of the miners’ strike that truly sealed Thatcherite policy on the unions in stone. Arthur Scargill led the National Union of Mineworkers (NUM) in a year-long strike to prevent proposed pit closures, an industrial struggle perhaps best illustrated by the brutal Battle of Orgreave for which South Yorkshire Police eventually paid £425,000 in compensation to 39 miners for assault and unlawful detention. After a year, the NUM capitulated. As Vinen puts it, the miners had endured ‘grinding poverty’ and the NUM, which had haemorrhaged over half of its members by 1987, was ‘technically bankrupt’. Having defeated Britain’s largest and most powerful union, Norman Tebbit wrote that Thatcher had broken ‘not just a strike, but a spell’. The defeat of the unions was one of many successes Thatcher had in implementing the policy platform that had been constructed for her, and again, it is the longevity of these reforms that is striking. Union membership in Britain has been in decline since 1985, core utilities remain privatised, and council house construction has become a drop in the ocean, illustrating how successfully the neoliberal agenda was implemented under Thatcher. Though broadly successful, Thatcher’s economic policy was not complete in its success or in its satiation of her self-confessed aims. A key area was monetary policy. Thatcherite political economy borrowed heavily from monetarism, which prioritised controlling inflation, by regulating the money supply, rather than unemployment. The Medium Term Financial Strategy (MTFS) was published in March 1980 and promised an emphasis on rules and discipline, rather than the discretionary laxity of the Keynesian regime. £M3, a measure of money supply, was chosen as a benchmark, and targets for its gradual reduction were set. Immediately, £M3 began fluctuating wildly, and Goodhart’s Law that ‘any monetary aggregate ceases to be reliable the moment it becomes a target for policy purposes’ came to fruition. As Davies puts it in his working paper, ‘the Government had ceded a large degree of its macroeconomic policy autonomy to the dominance of financial indicators centred on the monetary aggregates’ meaning it was left exposed to short-term volatilities. Most politicians would have abandoned this unworkable policy as soon as the inherent contradictions were apparent, but it was calls for the abandonment of the MTFS that led to the famous 1980 line ‘the lady’s not for turning’. Eventually she was persuaded to abandon the policy, but not before unemployment had rocketed above 3 million. In welfare policy there was a marked lack of decisive action in implementing a fleshed-out hatred of what Keith Joseph called ‘the Father Christmas State’ primarily borrowed from the New Right in America. Cuts never materialised, with social spending as a percentage of GDP much the same in 1997 as in 1979. Similarly, despite the eventual introduction of internal markets in the NHS, few of the radical calls for an American-style health insurance system were heeded, despite the NHS clearly being a bastion of the welfare state. Thatcher’s caution, combined with an appreciation for the popularity of the NHS, meant little action was taken in reforming healthcare. Despite many successes in implementing her programme, a failure to restructure the welfare state and the eventual abandonment of monetarism both suggest Thatcher’s only real obstacle in implementing her economic reforms was public opinion. Since the Suez Crisis of 1956 and the loss of the colonies after the Second World War, British influence on the world stage seemed to be in perpetual decline. One of Thatcher’s greatest successes was leading Britain to victory in the Falklands War. Thatcher’s first 3 years in office had been difficult; the failure of the MTFS, a surge in unemployment and the SDP-Liberal alliance polling above the Tories all confronted Thatcher ahead of the 1983 general election. Milton Friedman famously said that ‘Only a crisis, actual or perceived, produces real change’. Thatcher’s ability to turn a crisis into a coup made apparent when Argentine dictator Galtieri launched Operation Rosario to recapture the Falkland Islands, or las Malvinas, in April of 1982. Decisive action on Thatcher’s part — she dispatched a task force the day after the islands fell — made her a competent war leader. As Vinen puts it, she was ‘uncompromising about the end and pretty much indifferent to the means’, as illustrated by the controversial sinking of the ARA General Belgrano which killed 323 Argentines. Doubt surrounded British military capacities at home and abroad; ‘wet’ Sir Ian Gilmour predicted that ‘it will make Suez look like common sense’, whilst Clarke asserts that eventual victory came ‘to the world’s astonishment’. The Argentine surrender on 14 June 1982 saw the zenith of the jingoistic patriotism that the war, and, to an extent, Thatcher her self, had fostered. The Sun produced such infamous headlines as ‘Stick it up your Junta!’, whilst Thatcher, very much echoing Churchill, told the 300,000 that had attended the London Victory Parade that ‘we, the British people, are proud of what has been done, proud of these heroic pages in our island story’. In the context of the Second World War, and indeed the Suez crisis, Vinen argues that ‘Thatcher seemed to have recaptured the first and reversed the second’. Thatcher’s skilled handling of the Falklands War consolidated her image as a strong, unshakeable leader. She went on to win a landslide victory in what was arguably a khaki election in 1983 despite a poor economic record, allowing her to spend the next 7 years implementing her agenda unimpeded in the Commons. Though Thatcher’s handling of the Falkland’s War has been romanticised over the past 3 decades as the moment Britain, in Thatcher’s words, ‘ceased to be a nation in retreat’, the conflict must be put into context. 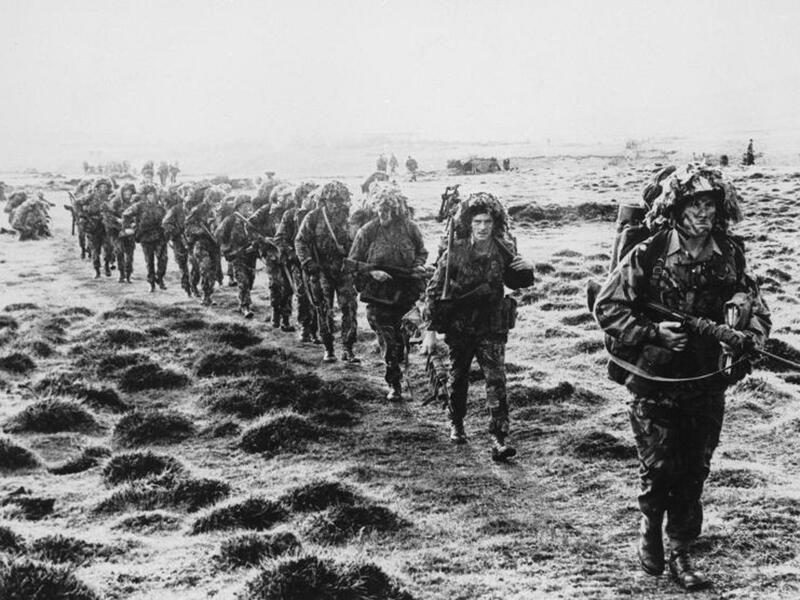 As contemporary Tory MP Julian Critchley put it, the Falklands war was ‘the very best sort of war: fought at a distance against a second-class enemy and no fear of retaliation’. Though she modelled her image as leader on Churchill, much more was on the line in the 1940s than in with 1983. When the course of action was not presented on a silver platter, as is the case with the European question, Thatcher struggled to find success. 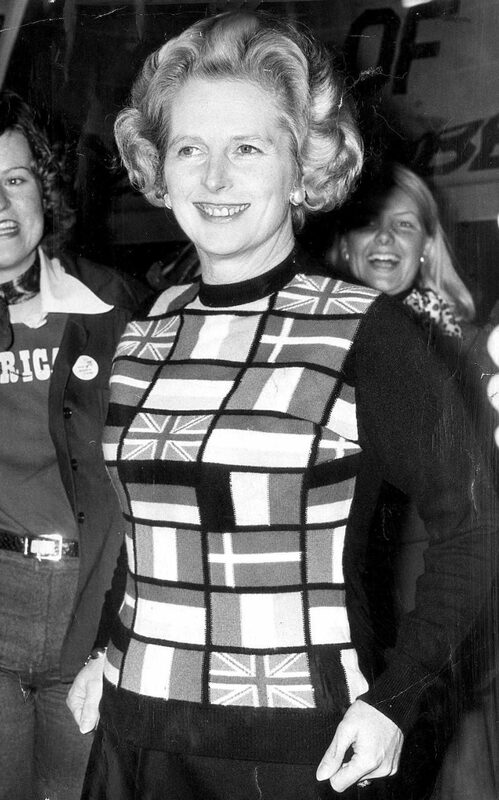 Despite campaigning to remain in the EEC in 1975, famously sporting a jumper with the flags of all 9 member states, Thatcher became increasingly Eurosceptic over the course of her tenure. Her most memorable attack on the European Community came in her 1988 Bruges Speech where she called attempts to create a single currency and deepen European integration an attempt to ‘introduce collectivism and corporatism’ and to ‘concentrate power at the centre of a European conglomerate’. The conflict in the Tory party was between those who, remembering the horrors of the Second World War, believed European integration would guarantee peace and those who wanted to defend British sovereignty against the encroachment of Brussels. Adviser to Thatcher Charles Powell asserts that Thatcher ‘had no single, consistent view of Europe throughout her political life’. Instead, she initially supported European integration, conditioned by her growing up during the Second World War, but later, decided that ‘either Europe would have to change direction and slow down progress towards integration’. It was this Eurosceptic shift that led to the infamous resignation speech of Geoffrey Howe as foreign secretary in 1990, where he criticised Thatcher’s failure to join the ERM much earlier in her tenure. The European issue undoubtedly played a key part in Thatcher’s downfall, and was one of the few policy areas where she lacked a consistent conviction on which she could fall back on. Margaret Thatcher was undeniably one of the most successful British prime ministers in the post-Second World War period. She dominated both her party and the nation for over a decade by way of political guile, sheer determination and self-assurance. Her ability to seize upon any opportunity presented to her, whether the Winter of Discontent or the Falklands War, provided her the political capital with which she could implement her ideological vision. Enduring reforms such as privatisation, the sale of council housing and the curbing of union power are all instances of the neoliberal agenda being successfully, though not wholly, implemented. A transformation of how Britain was perceived on the global stage both at home and abroad in the Falklands War was perhaps Thatcher’s most memorable success. Though issues like the poll tax and Europe eventually led to her downfall, Britain’s economic, political and global position had, by 1990, been transformed beyond recognition in Thatcher’s image. Next Does the British Government Really Control the British Economy?